Pre-owned needs just a bit of surface cleaning to make pristine. 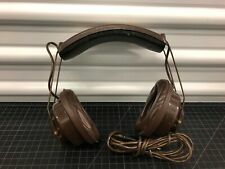 Koss Headset PRO/4AAA Vintage 70s Headphones EX Cond, TESTED! Good Sound! This item is in good pre owned condition. Works as it should. Comes just as pictured. Please view all photos before purchasing or making an offer. Keep in mind if you make an offer, there is 48 hours to answer and it can be purchased at full asking price over you in that time. If you have any questions please message me. Thank you! Don't miss a great deal! Koss KTXPRO1 headphones provide lightweight, adjustable portability with great titanium sound. The adjustable headband on these active headphones guarantees a comfortable, secure fit as you listen at home, at work, or anywhere in between. The Koss KTXPro1's in-line volume control and open foam ear cushions deliver hear-through high fidelity sound, the truest convenience in portable music. Foam ear cushions for open, hear-through sound. Koss Headphones. Product Type: Headphones. Building Materials And Products. Audio Video And Accessories Product Type: Sport Clip On Ear. Pivoting ear plates. Soft, foam ear cushions allow for hear-through sound. Koss Porta Pro Headphones,Rubber Wire,Red/Black With Straight Plug As Photos. Two adjustable temporal-comfort zone pads shift the pressure and perfectly balance the ear plates on your ear. You get just one pair of headphone with buggy bag. 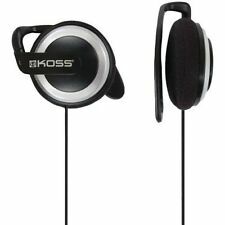 New ListingKoss UR20 TranSportable Stereo Headphones with Bonus Earbud - Brand New! Well suited for professional DJs seeking sound intensity and bass, the Koss UR20 Full Size noise isolating headphones are every bit as well suited for any music lover. Designed to endure the rigors of a recording session, these closed headphones just as easily enhance typical listening sessions. 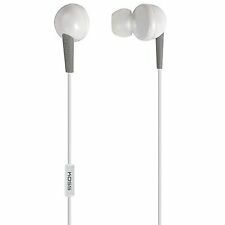 Durable on ear headphones. Over the head design with an adjustable headband. Maximum portability with lightweight design. 4 ft. cord. 3.5mm plug. 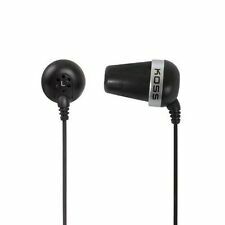 Koss Listening Headphones Black. These are for reference only and should be considered illustrative. Koss Porta Pro X (massdrop). Condition is lightly used. Shipped with USPS First Class Parcel service. I have a plethora of headphones, time to downsize. 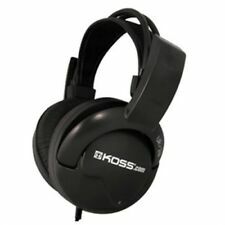 Koss Porta Pro black Headphones still in box. These were a gift that I never got around to returning. Brand new, never even opened the box. Koss Sporta Pro (SportaPro) Headband Headphones - Brand New in Box! 5 out of 5 stars - Koss Sporta Pro (SportaPro) Headband Headphones - Brand New in Box! 43 product ratings43 product ratings - Koss Sporta Pro (SportaPro) Headband Headphones - Brand New in Box! New advances in materials and design have served to expand the performance of stereo phones. Earpiece Type: Binaural. Passive Noise Reduction stereo phone system isolates listener from ambient sounds. KOSS 163684 KSC75 SportClip Headphones. Soft, foam ear cushions for open, hear-through sound. UPC: 021299148570 _|_. "They are nice and light and are very comfortable. They fit well, they're easily adjusted, and they're secure.". Trending at $17.21eBay determines this price through a machine learned model of the product's sale prices within the last 90 days. Charitable Donations: A portion of the proceeds of this sale will be donated to Denver area charities that help kids in crisis. We pick a different charity each month. 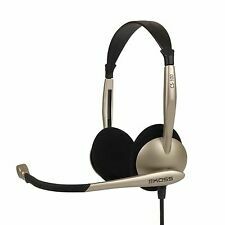 2 Pair Vintage Headphones Technics EAH-830 + Koss Pro 4AA - Very Retro! Tested and working Koss Pro 4AA Headphones! Limited Edition Discontinued Koss TBSE 1 Stereophone Head Phones. The stereo phone folds flat for storage in a durable cloth-covered case. Count on the Portapro to produce a rich sound that makes music dynamic and engaging. If listeners need to be aware of surroundings, i.e. on a run, the headphones open air cushions assist in spacial awareness and hear-through sound. 1996 Koss Headphone Catalog. Condition is Used. 18 page in excellent condition. New KOSS Noise Isolation Ear Buds w/ In-Line Mic. Includes Extra Cushions. 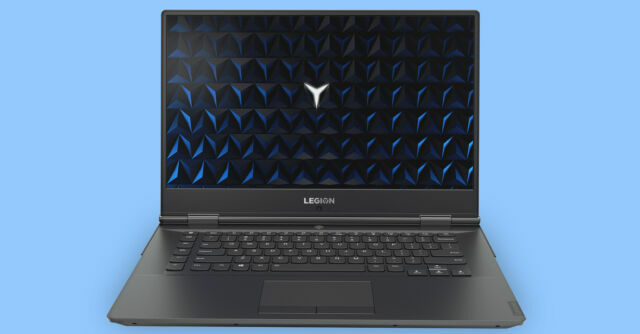 Slim form-factor maximum comfort. Koss Heaphones. Over the head. MONO STEREO options. Doesn’t come with aux cord. Koss Heaphones. Over the head. MONO STEREO options. Doesn’t come with aux cord.. Condition is Used. Shipped with USPS First Class Package. KOSS 175548 On-Ear Ear Clip Headphones. On-ear, ear clip stereophones. Lot of (2). Item Condition Includes a straight, dual-entry 4-ft cord with 3.5mm plug. Product Features. 2 PAIR ARE INCLUDED ! NEVER OPENED ! Item Condition 3.5mm plug. Sensitivity 112 dB. The Koss UR10 Stereo On-Ear Headphones can do just that, combining the very best in sound performance with a comfortable, lightweight headphone, so you can enjoy quality audio without sacrificing comfort. Model Number: 192211. 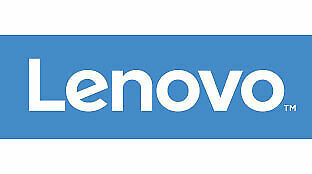 Manufacturer Part Number 192211. Product Model 192211. Manufacturer: KOSS(R). Manufacturer KOSS(R). Weight (Approximate) 0.1 lb.